This data set provides atmospheric carbon dioxide (CO2), carbon monoxide (CO), methane (CH4), and ozone (O3) concentrations collected during airborne campaigns conducted by the Atmospheric Carbon and Transport-America (ACT-America) project. ACT-America's mission spans 5 years and includes five 6-week field campaigns covering all 4 seasons and 3 regions of the central and eastern United States. Two instrumented aircraft platforms, the NASA Langley Beechcraft B200 King Air and the NASA Goddard Space Flight Center's C-130H Hercules, are used to collect high-quality in situ measurements across a variety of continental surfaces and atmospheric conditions. CO2, CO, and CH4 are collected with an infrared cavity ring-down spectrometer system (CRDS; Picarro Inc.). Ozone data are collected with a dual beam differential UV absorption ozone monitor (Model 205; 2B Technologies). Both aircraft host identical arrays of in situ sensors. Complete aircraft flight information including, but not limited to, latitude, longitude, and altitude are also provided. ACT-America's objectives are to study the transport and fluxes of atmospheric CO2 and CH4. At times they flew directly under Orbiting Carbon Observatory-2 (OCO-2) overpasses to evaluate the ability of OCO-2 to observe high-resolution atmospheric CO2 variations. This dataset provides results from the Summer 2016 and Winter 2017 campaigns. New data will be added approximately 6 months after the conclusion of a campaign. This dataset contains 350 ICARTT files and 350 netCDF files, one file of each type per flight. Figure 1: Flight paths for the ACT-America summer 2016 and winter 2017 campaigns. 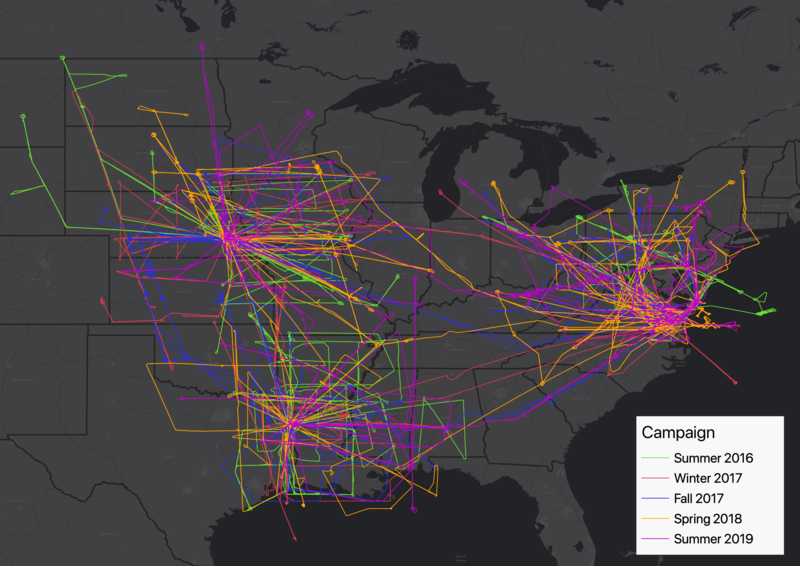 Flights were concentrated on three study domains: Northeast, South-central, and Midwest regions of the United States. This dataset provides atmospheric carbon dioxide (CO2), carbon monoxide (CO), methane (CH4), and ozone (O3) concentrations collected during airborne campaigns conducted by the Atmospheric Carbon and Transport-America (ACT-America) project. ACT-America’s mission spans 5 years and includes five 6-week field campaigns covering all 4 seasons and 3 regions of the central and eastern United States. Two instrumented aircraft platforms, the NASA Langley Beechcraft B200 King Air and the NASA Goddard Space Flight Center's C-130H Hercules, are used to collect high-quality in situ measurements across a variety of continental surfaces and atmospheric conditions. CO2, CO, and CH4 are collected with an infrared cavity ring-down spectrometer system (CRDS; Picarro Inc.). Ozone data are collected with a dual beam differential UV absorption ozone monitor (Model 205; 2B Technologies). Both aircraft host identical arrays of in situ sensors. Complete aircraft flight information including, but not limited to, latitude, longitude, and altitude are also provided. The ACT-America, or Atmospheric Carbon and Transport - America, project is a NASA Earth Venture Suborbital-2 mission to study the transport and fluxes of atmospheric carbon dioxide and methane across three regions in the eastern United States. Each flight campaign will measure how weather systems transport these greenhouse gases. Ground-based measurements of greenhouse gases were also-collected. Better estimates of greenhouse gas sources and sinks are needed for climate management and for prediction of future climate. Temporal Coverage: Periodic flights occurred during each intensive campaign. Four more campaigns to be added. Temporal Resolution: < 1 - 2 seconds, depending on instrument and flight. There are 350 data files in netCDF (*.nc) version 4 format following CF conventions 1.6. NetCDF files are structured as GeoTrajectory files, where the observations for a flight segment are connected along a one-dimensional track in space, with time increasing monotonically along the track. These files contain gas concentrations and data from the respective aircraft’s flight navigation system. The flight and altitude data were imported from the ACT-America P3-B Data System (for B200 flights) and Housekeeping data (for C130 flights). There are 350 data files in the ICARTT file format (*.ict). ICARTT files have detailed header information and follow the standards established and summarized in the ICARTT File Format Standards V1.1. https://www-air.larc.nasa.gov/missions/etc/IcarttDataFormat.htm. The files contain the same atmospheric gas concentration data as the NetCDF files, without the additional navigational or meteorological information. Naming conventions are the same for both file formats. Files are organized by instrument and aircraft for the flight(s) on a given date. R# = revision number of data. A higher number indicates a more recent revision. L# = optional launch number. Some flights had more than one sortie or launch. Additional information on the aircraft platforms deployed by ACT-America is provided in the accompanying files: Platform_B200.pdf, and Platform_C130.pdf. Data variables in both “PICARRO” and “Ozone” files. Flight information is provided in all netCDF files. ACT-America, or Atmospheric Carbon and Transport – America, will conduct five airborne campaigns across three regions in the eastern United States to study the transport of atmospheric carbon. The eastern half of the United States is a region that includes a highly productive biosphere, vigorous agricultural activity, extensive gas and oil extraction and consumption, dynamic, seasonally varying weather patterns and the most extensive carbon cycle and meteorological observing networks on Earth, serves as an ideal setting for the mission. Each 6-week campaign will accurately and precisely quantify anomalies in atmospheric carbon, also known as Carbon Flux. Accurate carbon flux data is necessary to address all terrestrial carbon cycle science questions. 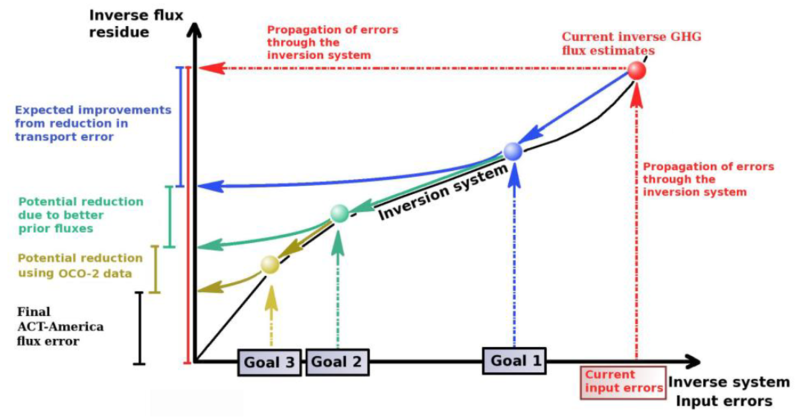 ACT-America addresses the three primary sources of uncertainty in atmospheric inversions — transport error, prior flux uncertainty and limited data density. ACT-America will advance society’s ability to predict and manage future climate change by enabling policy-relevant quantification of the carbon cycle. Sources and sinks of atmospheric carbon dioxide (CO2) and methane (CH4) are poorly known at regional to continental scales. ACT-America will enable and demonstrate a new generation of atmospheric inversion systems for quantifying CO2 and CH4 sources and sinks. Figure 2. A schematic showing ACT-America project goals. To quantify and reduce atmospheric transport uncertainties. To improve regional-scale, seasonal prior estimate of CO2 and CH4 fluxes. To evaluate the sensitivity of Orbiting Carbon Observatory (OCO-2) column measurements to regional variability in tropospheric CO2. ACT-America will achieve these goals by deploying airborne and ground-based platforms to obtain data that will be combined with data from existing measurement networks and integrated with an ensemble of atmospheric inversion systems. Aircraft instrumented with remote and in situ sensors will observe how mid-latitude weather systems interact with CO2 and CH4 sources and sinks to create atmospheric CO2/CH4 distributions. A model ensemble consisting of a mesoscale atmospheric transport model with multiple physics and resolutions options nested within global inversion models and surface CO2/CH4 flux ensembles will be used to predict atmospheric CO2 and CH4 distributions. Beyond the conclusion of the mission, application of the knowledge gained from this mission will improve diagnoses of the carbon cycle across the globe for decades. Picarro continuous CO2/CH4/H2O/CO: These instruments exceed the precision requirements of the baseline science objective for the mission for all four gases (Karion et al., 2013). Accuracies of 0.2 ppm for CO2 and 2 ppb for CH4 also exceed mission accuracy requirements of 1 ppm for CO2 and 4 ppb for CH4. 2B Technologies Continuous O3: The O3 monitor has been previously flown on tropospheric chemistry field missions and meets the accuracy and precision requirements for the baseline science objectives of the mission (Bertschi et al. 2004). Figure 3. 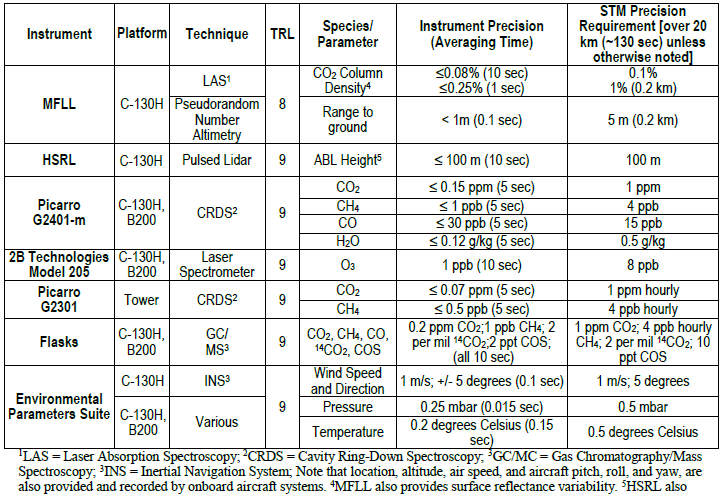 Instrument precision table as provided in the ACT-America proposal. The eastern half of the United States, a region that includes a highly productive biosphere, vigorous agricultural activity, extensive gas and oil extraction, dynamic, seasonally varying weather patterns and the most extensive carbon cycle and meteorological observing networks on Earth, serves as an ideal setting for the mission. Flights will concentrate observations on three study domains: Northeast, South-central, and Midwest. ACT-America will deploy the NASA C-130 and B-200 aircraft to measure atmospheric CO2 and CH4 in the atmospheric boundary layer (ABL) and free troposphere (FT). The mission proposes a total of 70 science flights, 528 hours for the C-130 and 396 hours for the B-200, dedicated in a roughly 3:3:1 ratio among fair weather, stormy weather, and OCO-2 underpass flight patterns. For fair and stormy weather flights, the C-130 will fly at 3-8 km above ground, collecting in situ measurements in the lower FT, remotely sensed, column-averaged CO2 measurements focused on the ABL, and occasional in situ vertical profiles. The B-200 will primarily sample the ABL. For OCO-2 underflights, the C-130 will fly at 8 km above ground with the B-200 flying in the ABL, both along the OCO-2 flight track. The existing in situ tower CO2/CH4 observing network will be enhanced with five additional tower sites. The mission will deliver 2-3 times more high-quality lower tropospheric CO2 and CH4 observations than any previous airborne campaign. Data from the fair-weather flights are intended to quantify regional CO2 and CH4 fluxes, and to evaluate fair weather atmospheric C transport processes. The flight pattern is designed to provide extensive sampling of the ABL and lower FT in source/sink regions, meeting the requirements for the fair weather investigation. The C-130 aircraft will fly a U-shape pattern with flight legs perpendicular to the wind, sampling FT and ABL properties downwind of the sources and sinks of C. The C-130 will fly at roughly two times the midday ABL depth, (~3-4 km above ground level (AGL)) with periodic descents and ascents (5 to 10 times in a 6-8-hr flight) to sample the ABL. Although clear sky conditions will be targeted, the C-130 will conduct more profiling if low-altitude clouds interfere with the remote sensors. The B-200 aircraft will partake in two flights per day and will sample a subset of the C-130 flight path focusing on long transects in the ABL with periodic ascents to the FT. The two aircraft will operate over the same time period, but precise coordination is not required. Data from stormy-weather flights will be used in combination with the data from fair-weather flights to evaluate the transport of C in the mid-latitudes. The flight plans include flight legs parallel to and crossing frontal boundaries at two or more altitudes, and crossing the frontal zone at two or more locations, meeting the requirements for the stormy weather investigation. The pattern for the OCO-2 inter-comparison flights is designed to obtain data to evaluate the degree to which OCO-2 column CO2 measurements capture true spatial variability in column CO2 content over the continents. Two OCO-2 under flights will be conducted during each campaign and will be selected to cover varying surface reflectance, topography, and aerosol and cloud cover, all possible sources of bias in the OCO-2 measurements. The C-130 flights will be 1000 km in length and flown at 8 km (28 kft) altitude to maximize the fraction of the atmospheric column sampled by the MFLL. The B-200 aircraft will sample a shorter (~360 km) leg in the ABL, often the largest source of variability in column CO2. The B-200 flight will be centered with the C-130 and both aircraft will be vertically stacked during the OCO-2 overpass. ACT-America deployed high-quality, field-tested trace gas and meteorological instruments. For this dataset, the C-130 aircraft carried the Picarro continuous CO2/CH4/H2O/CO analyzer; a cavity ring-down spectroscopy (CRDS) instrument (Picarro Inc.) used for rapid measurement of trace gas mole fractions (Crosson, 2008), the 2B Technologies Continuous O3 monitor for in situ ozone, and an environmental suite for in situ pressure, temperature and winds. The B-200 has the same in situ sensors except for winds. Picarro instruments: The C-130 and B-200 both have Picarro instruments. The Picarro instruments have been extensively tested on aircraft flights (Karion et al., 2013; Mays et al., 2009; Turnbull et al., 2011). Picarro analyzers are based on Wavelength-Scanned Cavity Ring Down Spectroscopy (WS-CRDS), a time-based measurement utilizing a near-infrared laser to measure a spectral signature of molecular absorption. Gas flows through a 35 35-cc optical cavity with an effective path length of up to 20 km and pressure of 140 Torr. Extremely stable and high-precision measurements are achieved through cavity temperature, pressure, and wavelength laser frequency control to better than 0.002°C, 0.00003 atm and 1 MHz, respectively. Aircraft instruments are similar to surface-based sensors, but use faster flow rates, solid-state data storage, and additional vibration isolation. These instruments exceed the precision requirements of the baseline science objectives for all four gases (Karion et al., 2013). Accuracies of 0.2 ppm for CO2 and 2 ppb for CH4 (Karion et al., 2013) also exceed mission accuracy requirements of 1 ppm for CO2 and 4 ppb for CH4. 2B Technologies Continuous O3: The Model 205 O3 monitor uses two ultraviolet beams in two cells to simultaneously measure O3-scrubbed air and unscrubbed air. This model has been approved by the Environmental Protection Agency as a Federal Equivalent Method (FEM) and is the fastest UV-based O3 monitor available. The O3 monitor has been previously flown on tropospheric chemistry field missions and meets the accuracy and precision requirements laid out in the STM (Bertschi et al. 2004). Crisp, D (2004), The Orbiting Carbon Observatory (OCO) mission. Advances in Space Research, 34 (4), 700-709, doi:10.1016/j.asr.2003.08.062. Karion, C. Sweeney, G. Pétron, G. Frost, J. Kofler, B. R. Miller, T. Newberger, S. Wolter, R. Banta, W. A. Brewer, E. Dlugokencky, M. Hardesty, P. Lang, S. A. Montzka, R. Schnell, P. Tans, M. Trainer, R. Zamora, (2013) Methane emissions estimate from airborne measurements over a western US natural gas field, Geophys. Res. Lett., 40, doi:10.1002/grl.50811. Mays, K. L. , P. B. Shepson, B. H. Stirm, A. Karion, C. Sweeney and K. R. Gurney (2009). “Aircraft-Based Measurements of the Carbon Footprint of Indianapolis”. Environmental Science & Technology 43(20): 7816-7823 DOI: 10.1021/es901326b. Turnbull, J. C., A. Karion, M. L. Fischer, I. Faloona, T. Guilderson, S. J. Lehman, B. R. Miller, J. B. Miller, S. Montzka, T. Sherwood, S. Saripalli, C. Sweeney and P. P. Tans (2011). Assessment of fossil fuel carbon dioxide and other anthropogenic trace gas emissions from airborne measurements over Sacramento, California in spring 2009. Atmospheric Chemistry and Physics 11(2): 705-721.